Jess at Chaleur Life is giving away a skein of her hand dyed worsted weight yarn (100% Peruvian Highland Wool, 100 grams/220 yards) in “Christmas Lights”. I don’t know about you but I think those colors are stunning!! This giveaway is open to the US, and ends on November 30,2015. So click here to enter the November Hand Dyed Yarn Giveaway, before all the crazyness of the holiday week ensues! Good luck as always and happy holiday knitting! 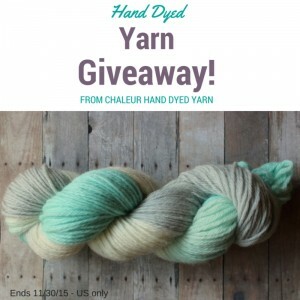 Share the post "November Hand Dyed Yarn Giveaway"